Established since 1996, M and H Car Valeting offers mobile car valeting throughout Cheshire, Macclesfield, Wilmslow areas. We have been AutoGlym trained and uses AutoGlym products for that special professional finish. Together with our reliability and punctuality it has helped to create and maintain the excellent client base we have today. 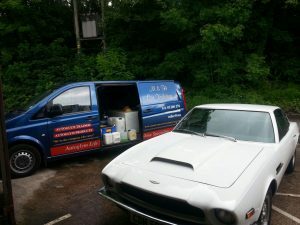 Our outstanding level of services is suitable for all types of vehicles, including Vintage, Classic and Performance cars. For example in 1998 we won 1st prize at the Tatton Classic Car Show for “pre-1950 Saloon Large Car” – a 1946 Bentley. M and H Car Valeting also provides a Body Shop facility including a collection and return service. We believe that our services can add value to your vehicles by maintaining them in showroom condition. If you have any questions regarding our mobile car valeting Cheshire, Macclesfield, Wilmslow services, please feel free to contact us.